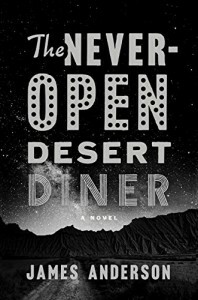 This is a very unique debut novel about a hard-working trucker, Ben Jones, whose days are spent making deliveries up and down Route 117 in the Utah desert. He’s heavily in debt and ready to lose his truck and business. His life changes when he meets Claire in one of the most unusual introductions I’ve ever read. The book branches off in many directions as you meet Ben’s customers, all of whom have their own stories to tell. Much of the book revolves around a decade’s old tragedy that happened at the desert diner. The main problem that I see about this book is that it’s so unbelievable. I could make a very long list of happenings in this book and the absurdity of each one but I don’t want to give away any of the plot. The author stretches belief to the limit. Plus I never could really get a good handle on the main character, Ben Jones. He sounded too educated to be leading the life he was living. While his compassion and love for his customers shined throughout this book, there were moments when he seemed violent. Other character’s actions also seemed conflicted. And yet there was something about this book that appealed to me. I think you need a very open mind going into this book and not expect it to all come together and make any sense. Think of it as a form of speculative fiction. While not science fiction or fantasy, it’s certainly on the fringe of reality. The book definitely hooked me and pulled me right in to that desert with all of its beauty, where I met some truly unforgettable people. This book was given to me by the publisher through LibraryThing in exchange for an honest review.